During my first weeks at university, one of my lecturers told me that if you touch the Buttercross, the city’s distinctive monument, you will always come back to Winchester. I don’t believe in superstition, but I do believe that Winchester is one of those places that I will always go out of my way to return to. My latest excuse was, of course, the Christmas Market. I decided on that first day that I would go every year. But as this was my first year not living in Winchester, I had to try a little harder to make it happen. After three hours, I was in Winchester, the platform somehow warmer than the train, but any concerns about temperature were dismissed entirely when I found my host for the weekend – The Lighter Journal’s own Deanna, my very dear friend. After a simple evening spent reminiscing over an unnecessary quantity of dough balls, we went to bed far too late. We woke to a dark sky the next day, eager to make the most of our time. It began with tea and toast smeared with raspberry jam, which didn’t wash off my fingers quite enough to prevent pink fingerprints on my cardigan. Such was our enthusiasm that we were in town before the shops opened, so we retreated to the warmth of Caffè Nero and downed mugfuls of toothpaste-tainted tea (not recommended.) We whiled away a few more minutes in New Look, where I made the horrendous decision to try on a jumpsuit, and bought a dress I considered far too short just to spite a fellow customer. By the time I’d changed back into my comfort zone of tights and a skirt, the Christmas Market was finally open. There’s always a lot of the same each year, I’ve found. The second year I visited I was disappointed; it was much as I remembered, the same stalls, the same smells, the same foods. How can there be excitement when things are the same? Well, through anticipation. As we queued, I thought of my favourite stall – on the corner just as you walk in, one which stains the air with citrus and spices; the silver jewellery laid against wood, the prices chalked on black slate; authentic Turkish delight nestled in amongst brightly painted bowls and felt hats atop mannequins with caricature faces. The anticipation ended and the shopping began. I purchased my potpourri heart, filled with scored limes, clementines, curled chillies and snapped cinnamon sticks. I bought a box of twelve huge fluff-filled chocolates to see me through the winter, I stroked cashmere and held gold to my neck and felt the grain of expensive wood. 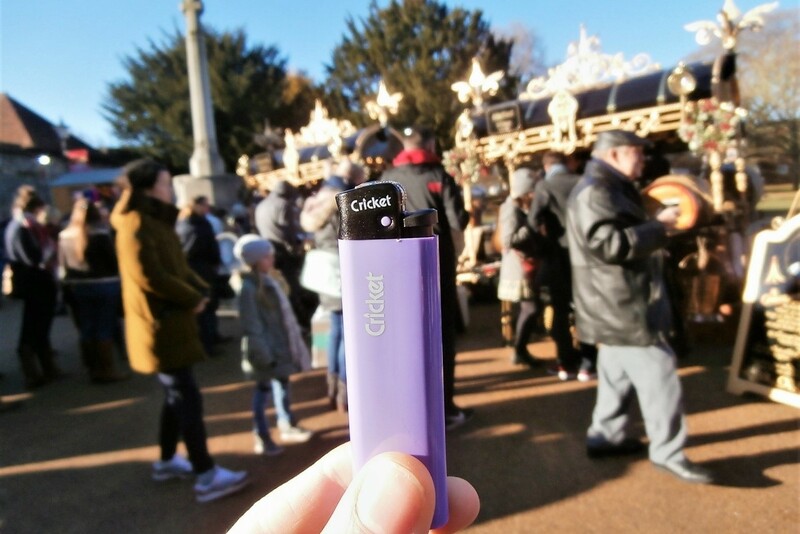 And in the constant motion of people, I managed to stop for a moment and take out my lighter. Purple this time, the colour of my university, of Winchester, of the place which I will always come back to and the place that I will always miss.